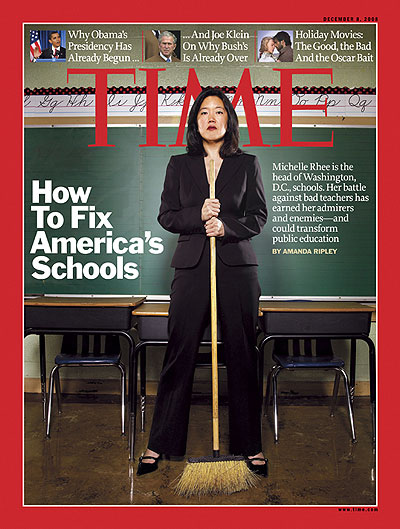 I read an article recently by Michelle Rhee, the chancellor of the District of Columbia Public Schools system of Washington, D.C. She is a fascinating person, and if you have not been exposed to her yet she is worth learning about (Time recently did an article on her, as you can see in the picture). The article I am referring to was entitled, “Ending Poverty Through Education.” The title alone drew me in. The entire article can be found here. I believe we can solve the problems of urban education in our lifetimes and actualize education’s power to reverse generational poverty. But I am learning that it is a radical concept to even suggest this. Warren Buffett framed the problem for me once in a way that clarified how basic our most stubborn obstacles are. He said it would be easy to solve today’s problems in urban education. “Make private schools illegal,” he said, “and assign every child to a public school by random lottery.” Think about what this would mean. CEOs’ children, diplomats’ children, many would be going to schools in Anacostia and east of the river, where most of our schools are. I guarantee we would never see a faster moving of resources from one end of the city to the other. I also guarantee we would soon have a system of high-quality schools. As the leader of a school system in a privileged country, I know we cannot have the same conversation about poverty in developing nations as we can about urban and rural poverty in the United States. But when we ask what it will take to ensure that no child anywhere has to “beat the odds” to have viable future choices, the answer is the same whether we are in Washington, DC or in a brave Haiti enduring disaster from a poverty-stricken stance.The obstacle is not one of knowledge but of social and political will, with education as the lynchpin. I entitled this post, “Why I believe education is a critical piece of alleviating poverty.” She summarizes well in that one paragraph what it usually takes me far longer to say. I think she is mostly right – that the obstacle is less about knowledge and more about social and political will. I also think that education is indeed a lynchpin in seeing the odds overturned. Now, as a Christian I hold a belief that probably does not match up with the viewpoint of many secular reformers. I truly believe that the most core problem we all have is sin and self centeredness, and that this problem can only be addressed through the forgiveness and restoration of Jesus Christ. I believe that sin is the primary reason we have poverty, and I believe that if someone is set free from economic poverty but is not correspondingly set free from their spiritual poverty then we have won a small battle but lost the bigger war. With that being said, I also believe that to stop there is a tragic mistake and misunderstanding of who Jesus and what Christianity is. Jesus came to bring spiritual liberation but he also intends to bring social and economic liberation. And though I acknowledge that there are numerous factors that are critical and interrelated to overcoming poverty, I can’t shake the conviction that education is always in the middle of the mix. Without addressing educational inequality – and addressing it from a really early age – I just don’t have much confidence that impoverished communities can turn themselves around. How do we respond to something like this? I think each person has to ask themselves that question. For some it might mean becoming a teacher, or becoming a better teacher. For others it might mean getting involved with tutoring or an after school problem. As a pastor in the city, I have felt led to rally behind a local grammar school and explore every creative avenue available for partnering together for long term success. But one thing seems sure to me. Failing schools means failing children, and failing children means failing communities and a failing nation. Everything I can do to stand up against that I am going to do. I am delighted on the common perspective we share concerning this topic. It is refreshing & encouraging to read the words of another likeminded soul.